Adobe is the only Leader in Digital Intelligence Platforms. Digital intelligence with scope and depth. Your customers come to you from different places, so your data insights should do the same thing. Adobe Experience Cloud’s digital marking and analytics solutions help you combine insights from existing, new, and emerging channels. 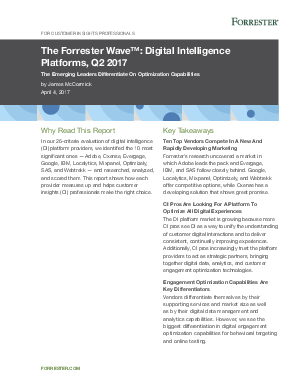 Read the Forrester Wave™: Digital Intelligence Platforms, Q2 2017 to find out why we stand alone among DI platform vendors.